It’s funny how once Fall begins, I immediately start craving all things pumpkin. Once the leaves start falling, I’m pretty sure it causes some chemical reaction in the air that somehow hypnotizes us to want it. Maybe the canned pumpkin companies are behind it somehow? Like – they have a little pumpkin fairy named Libby that starts circling the Earth sprinkling out pumpkin dust…. which is sort of like pixie dust, but instead of giving you the ability to fly – it activates the pumpkin loving taste buds in all of us. Yes, that has to be it! No wonder it’s hard to find canned pumpkin on the shelves around this time of year! Makes perfect sense to me. 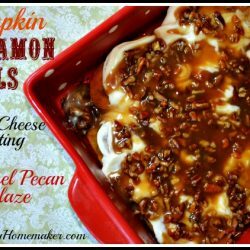 So, since Libby the Pumpkin Fairy has successfully activated my pumpkin taste buds – you know I had to come up with a new recipe to satisfy them! 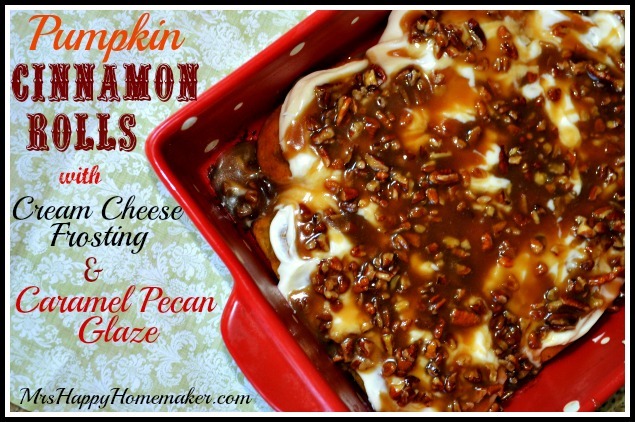 Enter Pumpkin Cinnamon Rolls. Just that in itself sounds good, doesn’t it? But, I had to take it up another notch. 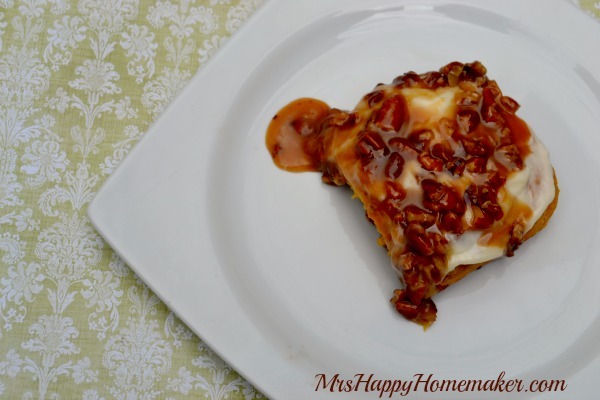 When I was developing this recipe, I started thinking about my Sweet Potato Cheesecake & the topping that goes on top of it. 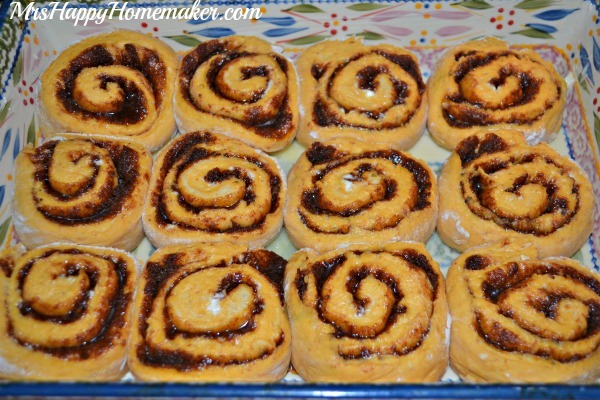 I just knew that it would be amazing on these cinnamon rolls…. and I was right. Oh. my. gosh. I don’t even know how to describe how good this is. There are very few things that leave me speechless (just ask my family!) but I seriously just can not find strong enough words to describe how inexplicably delicious these are. You’re just going to have to try them for yourselves and see what I mean. Set your bread machine on the ‘dough’ cycle. 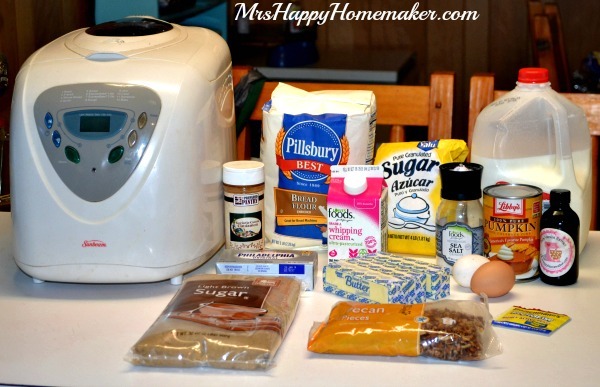 I love my bread machine! If you don’t have a bread machine, don’t fret. You can do it the old fashioned method 🙂 Dissolve the yeast in the warm milk in a large bowl. Mix in the sugar, margarine, salt, and eggs. Add flour and mix well. Knead the dough into a large ball, using your hands dusted lightly with flour. Put in a bowl, cover and let rise in a warm place about 1 hour, or until doubled in size. 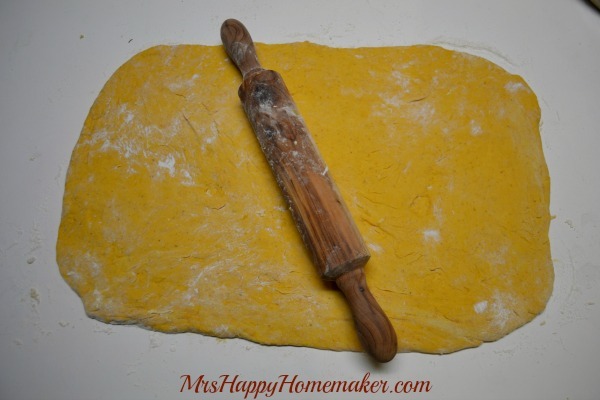 Once your dough is ready, place it on a lightly floured surface. Cover, & let rest about 10 minutes. Meanwhile, start mixing up the cinnamon filling. Combine 1 cup of packed brown sugar with 2.5 tablespoons of cinnamon; set aside. Spread on 1 stick of softened butter. I like to use my hands here, I find that I’m able to spread the butter around much more evenly this way. 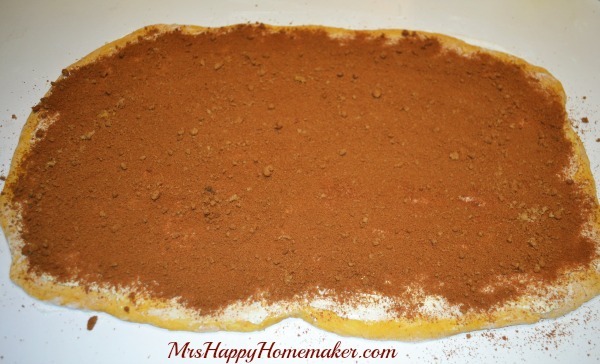 Now, sprinkle on the brown sugar/cinnamon mixture – making sure you get the surface evenly coated. Roll up the dough tightly. 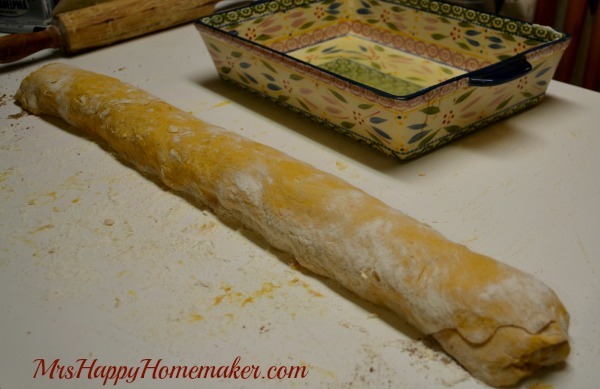 Use your hands to squeeze your dough roll all over to help get everything all snug inside… this also increases the length of it a little. Prepare your baking dishes (I use 2 9×13’s) by melting 1 stick of butter, & pouring half into each dish. 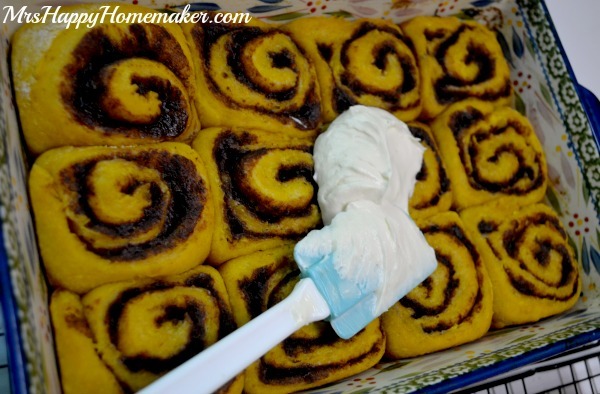 Start slicing your cinnamon rolls, about 1″ in thickness. Place the cinnamon rolls into your prepared baking dishes. Bake at 400 degrees for 15 minutes. Once baked, let them cool until they are warm… not scalding hot. Meanwhile, mix up your cream cheese frosting by beating together 1 softened 8z block of cream cheese, 1 stick of butter, 3 cups confectioners sugar, & 1 tablespoon of vanilla extract until smooth & creamy. Now, let’s get that delectable glaze ready. 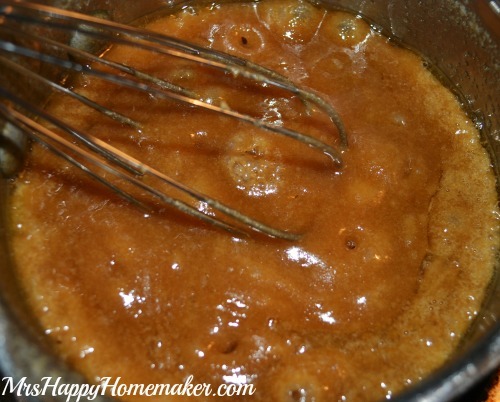 Combine 3/4 cup of brown sugar with 1/4 cup butter in a small saucepan. Stir over low heat until the sugar dissolves. Increase heat, and bring to a boil. 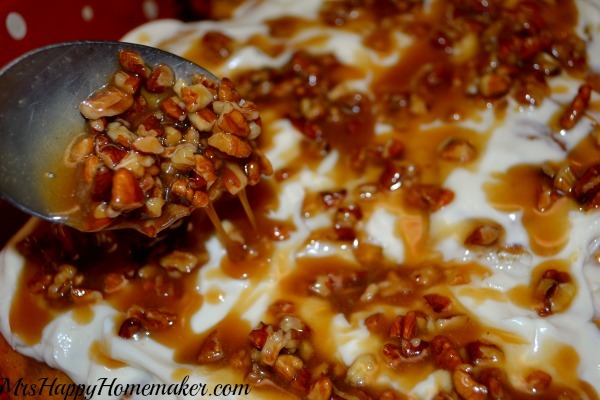 Mix in 1/4 cup of heavy cream, then 1 cup of chopped pecans. Remove from the heat. Frost the cinnamon rolls with the cream cheese frosting. 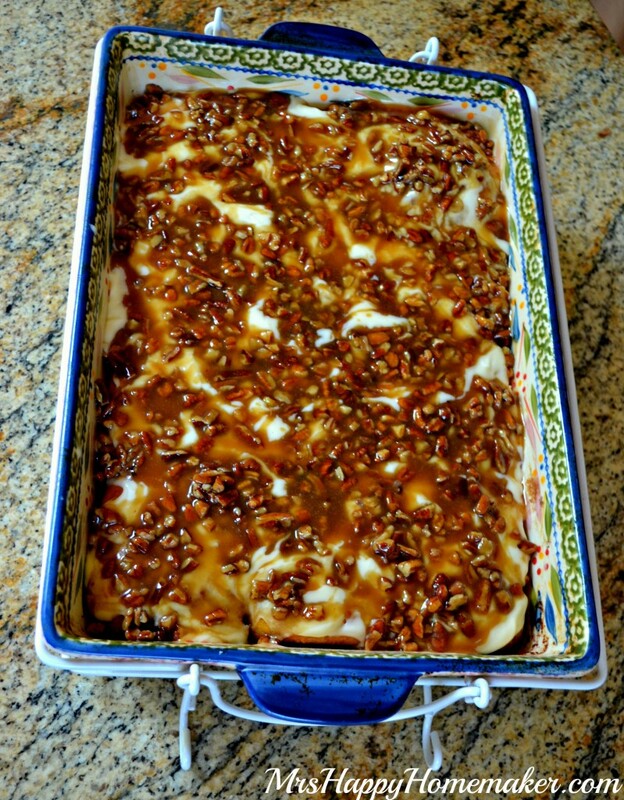 Pour on the caramel pecan glaze. Try not to inhale both pans of cinnamon rolls at once. I know it’s hard. Like super hard. Place the warm milk, eggs, melted butter, pumpkin, flour, salt, sugar, & packet of rapid rise yeast in your bread machine, in the order your bread manufacturer recommends – which is usually liquids first, then spices, then flour, and making a well inside the flour for the yeast. Set your bread machine to the ‘dough’ cycle. If you don’t have a bread machine, dissolve the yeast in the warm milk in a large bowl. Mix in the pumpkin, sugar, margarine, salt, and eggs. Add flour and mix well. 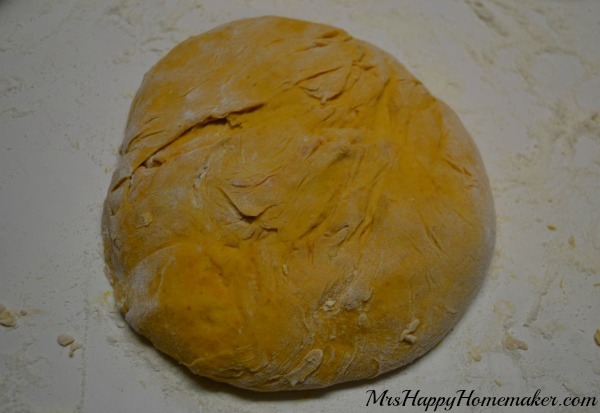 Knead the dough into a large ball, using your hands dusted lightly with flour. Put in a bowl, cover and let rise in a warm place about 1 hour, or until doubled in size. 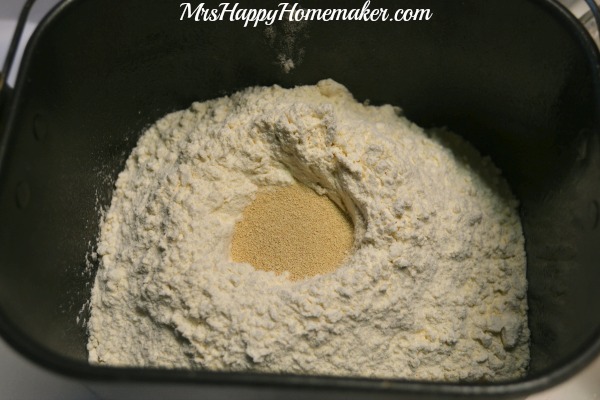 Once your dough is ready, place it on a lightly floured surface. Cover, & let rest about 10 minutes. 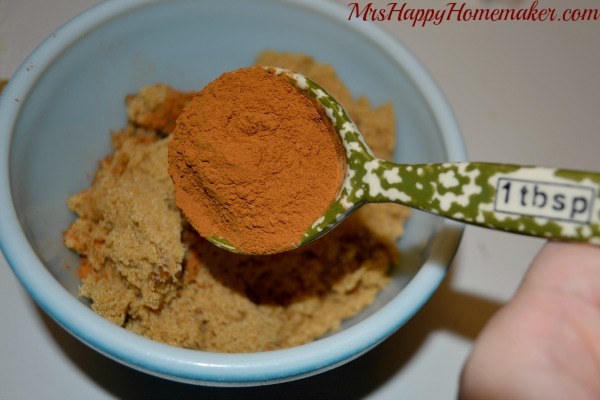 Combine 1 cup of packed brown sugar with 2.5 tablespoons of cinnamon; set aside. 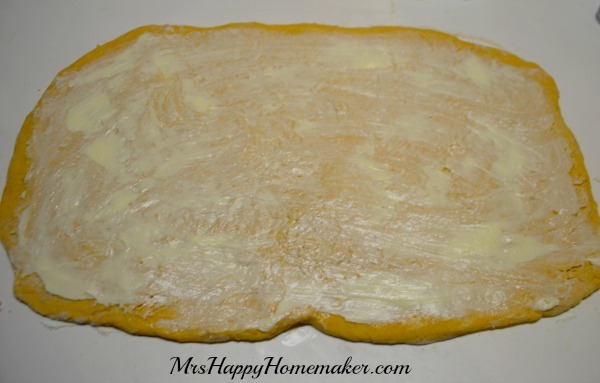 Roll out the dough into a large rectangle. Spread the softened butter over the rolled out dough; then sprinkle with brown sugar/cinnamon mixture. 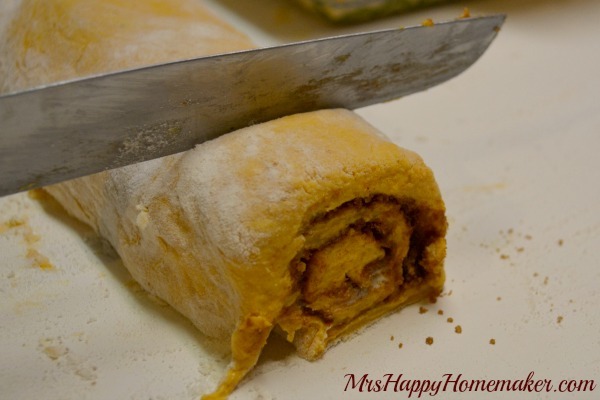 Roll up tightly, & slice into 1″ rolls. Beat the cream cheese, butter, confectioners sugar, & vanilla extract together until creamy. Set aside. Combine the brown sugar with the butter in a small saucepan. Stir over low heat until the sugar dissolves. Increase heat, and bring to a boil. 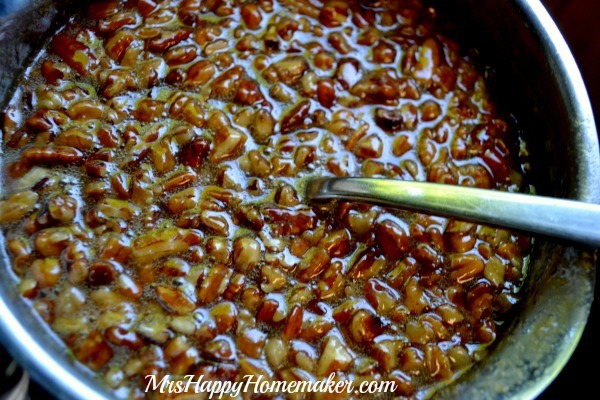 Mix in the heavy cream, then the chopped pecans. Remove from the heat. 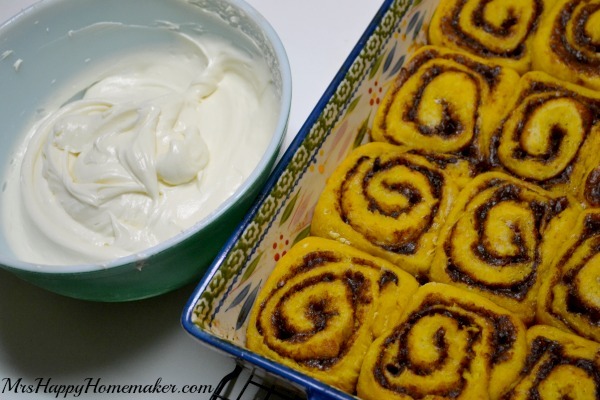 Frost the cinnamon rolls with the cream cheese frosting. 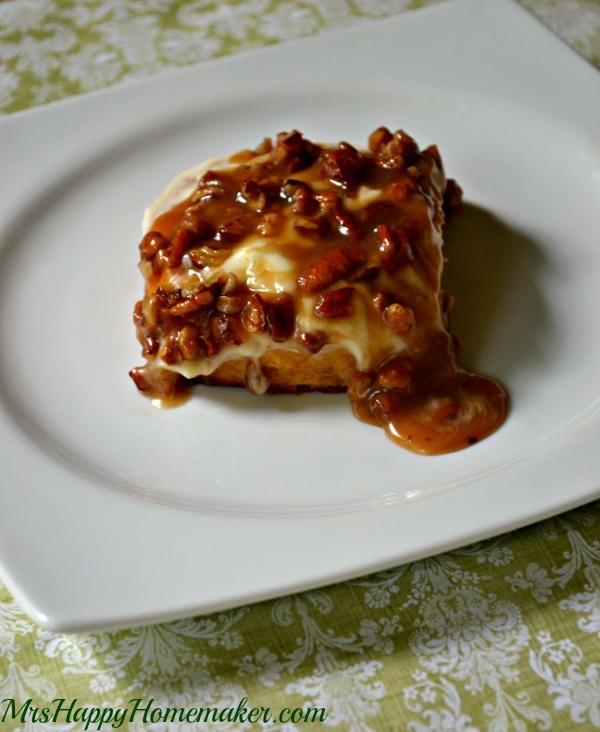 Pour on the caramel pecan glaze.